Trauma is real and it very much affects us emotionally, spiritually, and physically. Trauma is when we experience events that evoke fear, helplessness, rage, or confusion that disconnect us from our typical coping skills. Trauma often causes us to split from our whole self whereby we utilize more survival traits. It is the feeling of being “stuck”. The challenge with trauma is that it can take over much of our daily operating functions leaving us feeling like we are crazy, sick, or permanently damaged. Often times many legitimate traumatic events go overlooked because we do not recognize how traumatic they really are. We may try to place them in our own certain categories of severity. The reality is that our bodies do not distinguish trauma like we would do. Instead, we may find ourselves obsessing over certain events or conversations all the while pressuring ourselves to stop feeling that way thereby unintentionally exacerbating the problem. Trauma can be very difficult to navigate (especially without treatment) because often times we do not give it the attention it deserves. Trauma shows itself in the form of obsessive thoughts, nightmares, mood swings, and / or feeling helpless. It causes our brain to go into crisis mode. Sometimes the effects of trauma will appear in the form of dissociation, anxiety, or addiction. Trauma can be chronic, acute, or have a period of delayed onset. It may take on the form of PTSD or shows signs of PTSD but not fit all the criteria. Either way, if it is bothering you then it is worth getting treatment. Dissociation such as time slowing down, people appearing larger or smaller than life, time slowing down or speeding up, moments where you feel like you black out or go into a daydream like state. Trauma affects our brain to the extent that we go into a fight, flight, or freeze mode. Our prefrontal cortex (i.e. frontal lobe) disconnects from our limbic system (i.e. emotional part of the brain). As our result, we lose the ability of judgment. For example, you may have this overwhelming since of terror or rage at a very minor or normal occurrence to the average person. You may know intuitively that it is not a big deal but emotionally if feels really big. It feels so big that you just cannot shake it even though you have friends and family telling you it is OK. This disconnection is the aspect that leaves us feeling stuck and is the result of trauma. Trauma overwhelms the brain’s processing leaving pieces of the unprocessed experiences frozen in time and space. 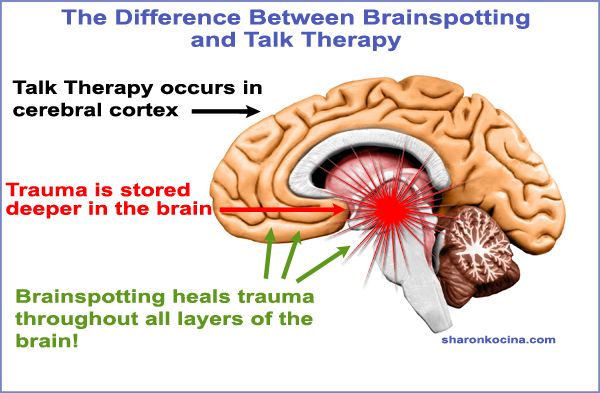 Most “talk” therapies access the neocortex. Research has shown that trauma is located in the subcortical area of the brain and not the neocortex. 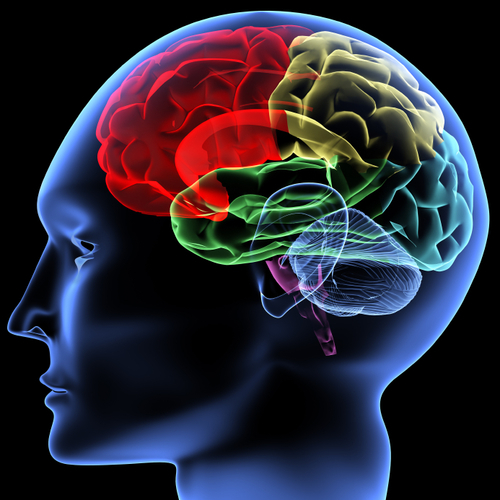 In the subcortical area of the brain there is no thoughts and language. It is hypothesized that a brainspot is the activity in the subcortical brain in response to focused activation and eye position. Or one can also say that a brainspot is seen as an eye position that correlates with physiological capsules that holds unprocessed traumatic experiences in memory form. Brainspotting (BSP) is a new psychotherapy approach that hypothesizes that the field of vision can be used to locate eye positions that correlate with relevance to inner neural and emotional experience. After these eye positions or brainspots are located, they may be maintaining eye fixation, lead to a healing and resolution of issues that are held deeply in the non-verbal, non-cognitive areas of the neurophysiology. BSP utilizes both focused activation and focused mindfulness as its mechanisms of operation. It aims as a full, comprehensive discharge of activation held in the brain and body. BSP is a “brain-body based” relational therapy. It is the dual atunement of the relational and neurobiological spheres combined and fits the Interpersonal Neurobiology model of Siegel. BSP appears to access the right brain, the limbic system and brainstem (midbrain) where the trauma and symptoms capsules are located in the brain. BSP is therefor seen as a physiological approach with psychological consequences. The technique attempts to bypasss the isocortex and access the allocortex, thus promoting more permanent internal regulation of subcortical processes. It is used and shown to be effective for treating PTSD, anxiety, depression, emotional blocks, addiction, and sports performance. It is a very gentle form of therapy especially in working with both single event and complex trauma. EMI is a psychotherapy that enables people to heal from the symptoms and emotional distress that are the result of disturbing life experiences. EMI uses much slower movements (than EMDR), designed to connect all the eye positions. 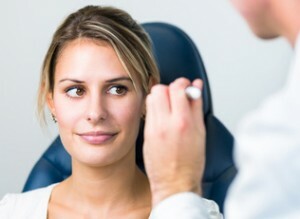 The importance of connecting all eye positions is based on the fact that the various movements of the eyes access different sensory systems and, therefore, different areas of neurology. Added to this is the EMI assumption that a traumatic experience remains unintegrated in a person’s life precisely because it is isolated, both in their neurology and in their thinking. The principle behind EMI is that “all the relevant multisensory dimensions” are required for full integration of the disturbing experience and thus the aim of the eye movements is to create “new linkages between different types of sensory, affective, or cognitive information.” The result does not extinguish the memory of what happened but it does strip off the emotional charge that was causing all the problems. Contact me for more information or setting up an appointment to discuss your situation by sending me an email to cornelia@corneliaswart.co.za I will get back to you as soon as possible.